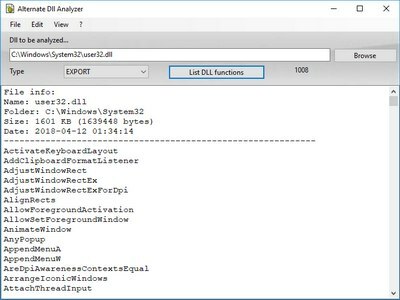 A simple application for displaying and extracting the available function names of a DLL-file. A DLL-file itself may contain several functionalities that can be used by multiple programs at the same time. This program is freeware. The application also offers the possibility to numerate the function names as well as displaying the image-header, common file information, a checksum and the version-info of the selected DLL-file. It can also be called with parameters from command line. This program requires the .NET-framework 2.0 (already included in operation system since Windows Vista).